In the Innovation Forum “Banks & Future” (Innovationsforum “Bank & Zukunft”) under the academic direction of Fraunhofer IAO (Germany), numerous banks and IT service companies have pooled their competences with regard to future trends in the banking sector. Their aim is to identify market-oriented opportunities for development and structural and technical optimisation potential, to bring together users and producers of technologies in the banking sector, and to initiate the necessary innovation processes. Ever since this research initiative was started in July 2004, a yearly trend survey has been part of the research work. In the Innovation Forum “Banks & Future” numerous banks and IT service companies have pooled their competences under the academic direction of Fraunhofer IAO with regard to future trends in the banking sector in Germany and in Europe. Their aim is to identify market-oriented opportunities for development and structural and technical optimisation potential, to bring together users and producers of technologies in the banking sector, and to initiate the necessary innovation processes. The main aspect is to enforce competitiveness through innovation in sales and industri-alised processes by adopting an integrated view. Use of modern information technology is seen as an enabler of future business models. In the meantime, the Innovation Forum “Banks & Fu-ture” has become an internationally accepted trademark for re-search and development in the financial services sector. It addresses innovative companies having a vital interest in advancing existing business processes as well as utilising the potential of innovative technologies. developing personnel, organisational and technical infra-structures for the implementation of future business mod-els in banking. The following figure shows the project’s main areas of research. test and demonstration of innovative IT solutions at the show case “Banks & Future” at Fraunhofer IAO in Stuttgart. The Innovation Forum “Banks & Future” was initiated in 2004 by Fraunhofer IAO and IBM Deutschland GmbH. Since the beginning of this joint research project, the following partners were involved in the research process: 3X-Banktechnik, Akademie Deutscher Genossenschaften ADG, Allen International Ltd., arvato logistics services – arvato distribution GmbH, Berliner Volksbank eG, Bosch Sicherheitssysteme GmbH, Cisco Systems GmbH, Citibank Privatkunden AG & Co. KGaA, Commerzbank AG, DaimlerChrysler Bank AG, Deutsche Apotheker- und Ärztebank, DWP-Bank, Elaxy GmbH, Equens AG, Fiducia IT AG, GAD eG, inasys Gesellschaft für Informations- und Analyse-Systeme GmbH, Nord/LB Informationstechnologie GmbH, MVR Marketinggemeinschaft der Volks- und Raiffeisenbanken e.V., S&N AG, Siemens AG, Sparkasse Pforzheim Calw, Sparkasse Pfullendorf-Meßkirch, Strähle Raum-Systeme GmbH, Tineon AG, Vitra GmbH, Volkswagen Bank GmbH, Vereinigte Volksbank AG Böblingen/ Sindelfingen – Schönbuch – Calw/Weil der Stadt, VR-Bank Rhön-Grabfeld, VR Bauregie GmbH, and Wincor Nixdorf International GmbH. Since 2004, Fraunhofer IAO has established a yearly trend survey of the German banking market called “Banks & Future”. The survey addresses bank managers of different banking sectors and of different bank sizes. Since 2007, the trend survey has been extended to the European level and will be continued in 2008. In 2007, about 460 bank managers in Germany and about 80 bank managers from other European countries participated in this survey. Survey design is based on research results of the Innovation Forum “Banks & Future”. In turn, the empirical results provide the basis for further research by the Forum. Figure 2 gives an overview on the main aspects. 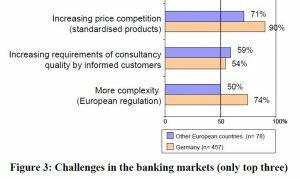 In the financial service sector, and especially in the area of retail banks, there is an intense competition between banks and a high pressure to improve customer orientation (see Figure 3). This pertains to increasing price competition in the field of standardised products as well as increasing demands from “better” informed customers for high quality consultancy. Even the German banking market is affected by a heightened price competition (90 per cent in Germany, 71 per cent in other European countries). Banks also have to cope with more European regulations to prepare for harmonised European financial markets. 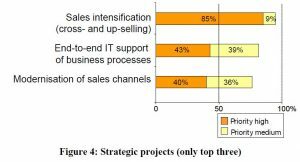 Looking at actual strategic projects, the intensification of sales activities has highest priority for increasing cross- and up-selling rates (see Figure 4). Another point is to improve organ-isational effectiveness and efficiency by establishing end-to-end IT support of business processes. Finally, bank managers have ranked the modernisation of sales channels among the top three strategic projects for innovation. In summary, the bank managers plan to renew the business models by innovation in sales and by optimising value chain processes. Innovation in sales involves a new design for the interaction of bank and customers. 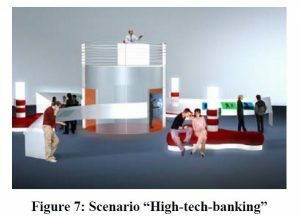 Despite the trend toward face-to-face contact, the virtual branch has also gained relevance for customer interaction; while it has further development potential also a variety of requirements need to be met for tapping its full potential. Innovation in sales demands a well-integrated comprehensive approach, which considers all sales channels and their interrelations. 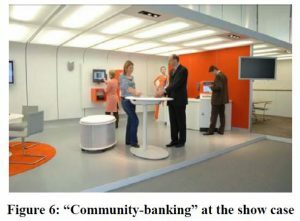 At the Innovation Forum “Banks & Future”, four scenarios for future banking were developed, which characterize future-oriented concepts of interaction and focus on the communication between customer and consultant. In this scenario, customer interaction is based on individual con-sulting. At the show case, a biometric and a Radio Frequency Identification (RFID) based customer recognition supports the new role of a “navigator”, who addresses incoming customers based on Customer Relationship Management (CRM) informa-tion. The branch design and integrated technologies encourage a consultancy approach that reflects a long-term customer relation-ship providing support over a lifetime, even beyond banking. The branch is a communication and experience space that provides customers with additional occasions for interaction (e.g. “after-work-banking” at a bank café and supplementary services by partners). Self-service areas are connected to the workplace of a “service assistant”. Areas of “communication” and areas of “privacy” are combined in an open space concept. Customers and non-customers are invited to visit the branch. The idea of “financial shopping” requires easy access to standardized financial services. The informed customer can do business at self-service terminals or by approaching a “service assistant”. The branch is part of a multimedia-based communication and interaction concept. New media and enhanced information services support personal communication in and outside the branch. 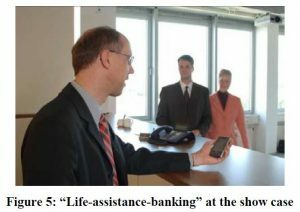 The scenarios “Life-assistance-banking” and “Communitybanking” have been presented at a show case at Fraunhofer IAO since May 2007 to demonstrate innovative sales processes supported by innovative IT solutions. Additional scenarios reflecting new opportunities of direct sales channels by using new technologies like Web 2.0 or virtual sales rooms are part of the ongoing and future research work. The term “bank industrialisation” describes the transfer of technological concepts and management processes from the industrial to the financial service sector. Industrialisation focuses on the capability of a bank to optimise the complete value chain by managing the vertical and horizontal integration of business partners as well as implementing a mature business process management within the organisation. In the trend survey “European Retail Banking Survey 2007” by Fraunhofer IAO, about 46 per cent of the banks achieved significant success as a result of implementing industrial methods, 49 percent achieved minor success and only 5 per cent of the participants stated that they had no success with industrialisation. With regard to the expected industrialisation potential, 13 per cent of the participants estimated a very high potential and 57 per cent estimated a high industrialisation potential in their banks. To achieve the potential of industrialisation, the implementation of a professional business process management is a key success factor. At the Innovation Forum “Banks & Future” an industrialisation assessment tool was developed, which enables bank managers to analyse the actual situation of banks with respect to industrialisation. 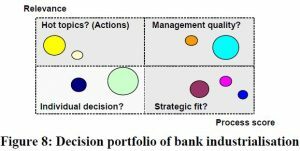 The tool integrates the structured analysis of the bank’s strategies, its process alignment and its process management maturity (see Figure 8). The industrialisation assessment tool provides information at the strategy and operational level of bank management. The industrialisation assessment must be extended to other organisational issues. In a next step, a structural model of an industrialised bank will be developed that reflects increasing requirements in flexibility and agility. On this basis, the tool set will be expanded to include additional aspects of industrialisation. Establishment of a European financial market, growth of niche players and cooperation across borders (agile and flexible). Besides price competition, other critical success factors such as service quality, added value and speed will gain increasing significance. Redefinition of value chains in extended models of co-operation, assessment of structural changes in banks including new roles. An industrialised value chain enables agile and flexible service composition to address changing and new markets. Banks invest in customer contact and emotional selling, without losing the benefits of bank automation and of new communication technologies like Web 2.0 and virtual sales. Biometric solutions are a standard part of security concepts and are used to support customer convenience. New bank profiles require different management skills. Better informed customers ask for well educated banking people. In the context of the Lisbon strategy and the Barcelona targets, the Luxembourg government intends to increase the level of public spending n R&D from about 50M€ in 2005 to 220 M€ by 2009 and to concentrate the budget increase on a limited number of promising re-search areas on the basis of clearly stated strategic and operational objectives. The purpose of the first national foresight in Luxembourg, conducted in 2006-2007, was to inform policy-makers and provide direction for the definition of these national research priorities. Foresight activities usually aim at decision-making and priority setting in the public sectors of systems of innovation, while the other parts of the RTDI-system have been largely left out of picture: most notably all the entrepreneurial actors on the private side (who actually bring the innovations to the market. This EU-study has been launched to take a first look at the current uses, practices and impacts of foresight in the private sector. It is based on personal interviews with 18 selected European enterprises from hightechnology industries, consumer goods and the service sectors. A workshop, organized in November 2002 with the participation of corporate foresight practitioners, confirmed the overall findings of the report. Ireland has set ambitious goals for the development of its rural regions. This foresight exercise asks if the goals of state policy for rural Ireland will be achieved on the basis of current trends, what can realistically be achieved and what needs to be done to ensure a desirable outcome. The conclusions of this foresight exercise are framed in terms of 3 main actions to be undertaken immediately if the state is to realise its ambitions. This brief is about a study on the Future Mobile Markets & Services that employed a Foresight approach. The role of the study was to provide a robust and realistic understanding of future demand for radio spectrum for mobile services up to 2020. The first challenge was to create an estimate based on sound socio-economic principles rather than techno-centric wish lists. The next was to achieve European consensus on this understanding so it could be supported by all EU players in international fora such as the ITU based in Geneva. The final goal was to develop and apply a method for estimating demand that could gain the support of and be taken up by the 136+ countries involved in ITU Working Party 8F that is trying to understand demand for services and their markets in preparation for WRC-07 – a World Radio Conference to take place in 2007 at which mobile radio spectrum will be apportioned internationally. ‘Jugend denkt Zukunft’ was setup to make this vision come true and translated directly into English it means ‘young people are thinking about their future’. This single issue foresight exercise is designed to involve young adults in the process of economic development. Together with companies, students between the age of 15 and 18 develop new products and services for the world of tomorrow. The main pillar of this program is the nature of co-operation between companies and schools. Further support comes from politics and science. Together they are strong partners for re-creating a culture of innovation. Consistent with its overall mission to encourage a more anticipatory approach to dealing with change, the Industry Sector Futures initiative of the EMCC offers analyses and insights at a sectoral and European level on drivers of change, scenarios for sector futures and key policy issues and implications that will affect the future of industry sectors in Europe.